Neocell is dedicated to providing premium collagen peptide-based dietary supplements for skin, connective tissue and joint health for consumers worldwide. Neocell started in 1998 in Newport Beach California with an extraordinary personal experience. After major surgery, the benefits of collagen were so powerful for one man, Al Quadri, that he was inspired to start a company, in the hope that he could help others with this amazing ingredient. And so Neocell was born, as a small, research grounded family owned business that had the goal of introducing to the world the anti-aging and overall health benefits of a naturally-sourced collagen based supplement line. The Neocell family has grown over the years, and they are proud to say that millions of customers have experienced these benefits and are living healthier lives because of doing so. There’s nothing more beneficial for one’s health than a bowl brimming with freshly plucked blueberries. The benefits of blueberries are more than just antioxidants. They aid in reducing belly fat, promote a healthy urinary tract, preserve vision, starve cancer cells, improve digestion, make an excellent anti-depressant, and address a multitude of concerns and illnesses. 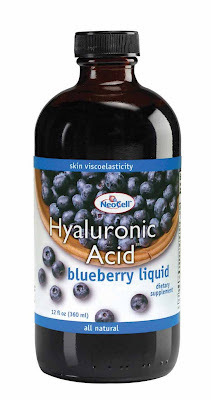 The Blueberry Hyaluronic Acid Liquid gives your skin and joints the moisture that they crave for, while giving an antioxidant boost with additional benefits from pomegranate and green tea. With green tea in the mix, the health benefits include: anti-inflammatory effects, potential delay or prevention of cancer and neurodegenerative diseases as well as assistance in lowering LDL cholesterol, increased fat metabolism, and diabetes prevention. I honestly haven’t noticed a significant difference in my health or skin since I started taking this liquid supplement. However, I still start out each morning by taking one tablespoon. The benefits are probably just not noticeable….yet. It is slightly tart, but I find the taste to be quite pleasant, a far cry from my organic pre-natal liquid supplement that I also take everyday. If the tartness throws you off, you can easily add a tablespoon to just about any beverage, such as juice.